BeBe comes from a large family. His parents, Delores and David Winans raised seven sons and three daughters. The family was Christian. Winans says music, God and family was the foundation of his upbringing. At the age of 17, BeBe and his 15-year-old sister Priscilla, called CeCe, left home for Pineville, North Carolina. They began their professional music careers as background singers on the popular Christian television show “PTL Club.” PTL stood for Praise the Lord. Winans says the hosts of the show, Jim and Tammy Faye Bakker, treated him and his sister as family. While there the siblings recorded their first album “Lord Lift Us Up” for PTL Records. The brother and sister recorded five albums together. In 1995, they decided to seek individual careers. As a lyricist, BeBe Winans says he always knew he could express his spirituality in any song, be it gospel or contemporary. BeBe Winans has several solo albums and six Grammy awards. He also has written and produced hit songs for others. And he is an actor and author. Several years ago Winans wrote a musical about his life. 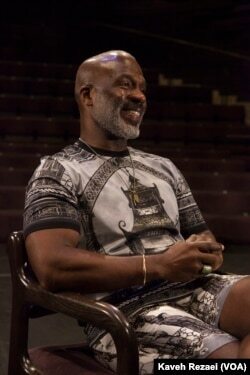 Winans and family friend and director Charles Randolph-Wright together wrote “Born for This, The BeBe Winans Story.” The artist says it all began with a phone conversation with the singer-songwriter Roberta Flack. BeBe says “Born for This” explores his and his sister’s personal and musical journey. The actors who play BeBe and CeCe Winans in “Born for This” know their subjects pretty well. That is because they are Winans themselves. BeBe is happy about the family connection. “It’s been an absolute joy to see my niece Deborah Joy and my nephew Juan who are brother and sister, playing a brother and sister who happens to be their uncle and aunt. It’s hard to put in words how I feel when I see them, knowing just like my parents knew, there was some talent that they saw in us so they nurtured that talent. I saw that talent in Juan and Joy when they were knee high. To see them during rehearsals, it was funny to see how they learned a lot more about their aunt and uncle and what we with through when we were there age and younger. And so every time I see them on stage I am just tickled if I can say that. The musical celebrated its world premiere on April 23, 2016 at The Alliance Theater in Atlanta, Georgia before making its way to Washington, D.C. for performances at the Arena Stage.